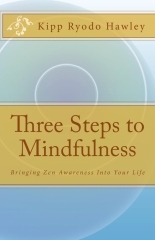 Zen Mindfulness is complementary with Zen meditation. They correspond to the last two factors in the Eightfold Path of Buddhism: Right Mindfulness and Right Concentration. Called “zazen” in Japanese, this kind of meditation isn’t what is known as “mindfulness meditation”, but rather an extended visit to the essential source of our life. “Za” means “sit”, and “Zen” means “concentration”, so the word literally means “sitting meditation”. When learning zazen we’re told that this is the zazen of the Buddhas, even that it is Buddha that is sitting. What could this mean? Our physical posture influences our life more than most of us know. Here is an interesting TED talk on the subject by social psychologist Amy Cuddy. She mentions the phrase “fake it til you make it”, which can sound a little cynical the first time you hear it, but is actually a very practical guideline to getting us from where we are now to where we would like to be. Zazen works on many levels. One important facet is the physical posture. Sit like Buddha from the beginning, and the more you do it, the more both body and mind are conditioned to be Buddha. Eventually you will realize that – yes! – you have been Buddha from the very beginning, and it was Buddha sitting as Buddha from the very beginning.